Customer satisfaction is our number one priority. We specialize in Custom Molded Rubber and Plastics products. Our objective is to ship quality and reliable products to all of our valued customers. Our goal is to maintain a Quality Management System that meets or exceeds the requirements of ISO/IATF 16949:2016 standard. We are continuously improving the manufacturing process, products, and service, without compromising quality, to meet or exceed the expectations of our customers. US owned and operated manufacturing company. 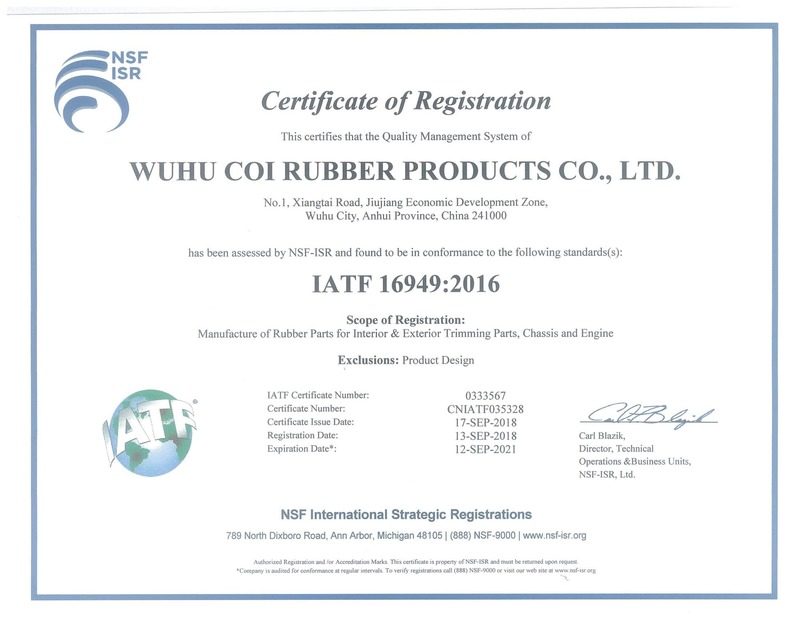 Coi Rubber has one of the highest quality management systems recognized worldwide. Expect automotive level quality standards (IATF 16949:2016) or higher. Read our quality manual online! American quality standards at factory-direct prices. Friendly US customer service at YOUR time, in YOUR language. Coi Rubber has over 28 years of experience in Engineering, Design, Compounding, Prototyping and making YOUR business OUR business. From cost saving solutions to the highest performing ingredients and techniques, allow our professional team put our training and other procedural techniques to benefit your business today! Coi Rubber has over 28 years of experience in Engineering, Design, Compounding, Prototyping and making YOUR business OUR business. From cost saving solutions to the highest performing ingredients and techniques, allow our professional team put our training and other procedural techniques to benefit your business today! Allow us to be your supplier of choice not only for cost savings but for creating solutions and superior products. Speak to us today and see the difference we can make! Across many markets, hundreds of companies rely on Coi Rubber to provide exceptional rubber products and services to support their success. Customers across a wide variety of markets have confidence in our over 28 years of experience, our diverse network of contacts and our ability to meet all of their needs on time, every time. We are continuously improving the manufacturing process, products, and service, without compromising quality, to meet or exceed the expectations of our customers. Coi Rubber Products was established to service the Rubber & Plastics Industry. We started in molded products serving the agriculture industry. Since then, we have expanded into a variety of rubber products which includes molding, extrusion, and rubber to metal bonding. Coi Rubber serves a wide variety of companies in different industries, some industries include the Automotive, Industrial, Food Processing, HVAC, Appliance and others. We offer injection molded rubber, or any custom rubber or plastic products. We offer competitive pricing, fast lead time, and US local customer and engineering service. Coi Rubber Products is a full-service rubber manufacturing company that has the some of the highest rubber standards in the US rubber industry. With over 50 years of experience in the manufacturing, processing, and fabrication of extruded, custom molded, die cut, and laser cutting products. We strive to have excellent product guarantee and outstanding customer service. Coi Rubber Products offers a large variety of customized rubber products for all types of industries. We provide competitive pricing on all custom rubber products, our rubber material is unmatched as far as durability and tolerance in the rubber industry. We have experience working with companies in automotive, appliance, heavy trucking, agriculture, medical, and HVAC industry. We have an in-house team of individuals that is qualified and ready to meet any product requirements necessary. This includes FDA grade requirements, military specifications, and any other product specification that is needed within your industry. We have a large amount of experience to provide everything from the latest technological advances in rubber to completely custom rubber products.